With the exception of Purim, nobody really associates “Persia” with “party,” so we shouldn’t be too terribly surprised that Iran had to rain on the love parade that is the Oscars by proclaiming it a triumph over Israel since it beat Footnote, Israel’s entry into the Best Incomprehensible Film Category (oops, Jewdar’s factchecker has just informed us that’s “Best Foreign Language Film). At the same time that Iran is crowing, many are carping that the Oscar’s choice of Billy Crystal to host reflects how outdated it has become. In typical Jewdar fashion, we shall connect these two seemingly unrelated stories into a heartwarming narrative celebrating the triumph of the Jewish people. Okay, so maybe Iran’s entry did trump Israel’s. But as the presence of Crystal illustrates, the Oscars isn’t just about individual awards, it’s about the film industry as a whole, and as far as that goes, what could be more fitting than having an old Jew host the awards, since it’s primarily old Jews who make the decisions, sign the checks, and ultimately produce, write and direct the films that make the whole thing possible? Even many of the hip youngish talent whom some people believe could re-energize the Oscars will one day be old Hollywood Jews themselves (we’re looking at you, former Heeb coverboy Jonah Hill) So let the Iranians have their Oscar–we’ll take everything else (and that includes, of course, Oscars picked up by NJB Michel Hazanavicious’ The Artist for Best Picture, Best Director, and Best Actor. Oh, one more thing, in the spirit of generosity embodied by the awards–mazel tov to the Iranian filmmakers on their award. Would you guys mind doing a photo shoot with it alongside some of Iran’s most prominent nuclear scientists? I’m in my mid-twenties and I thought it was far better than when my fellow millennials hosted last year. I guess the the New York Times would be the expert on descending institutions though, so what do I know? And to think: We geezers are supposed to be the ones with short term memory problems. The whole reason that Crystal was drafted to do the Oscars was awardus interruptus. Remember? The ever so much more fabulous Brett Ratner was supposed to helm it, with Eddie Murphy as the host. But – UH-OH – there was that nasty GAY-BASHING incident. Not by geezer Crystal, but by the hip fabulous Ratner. Ratner was out, and Murphy quit in sympathy with Gay-Bashing Ratner. That’s how you wind up with a gracious, but admittedly off-key, geezer host. And regarding last year – While Anne Hathaway was game, James Franco was clearly having an out of body experience. Billy, Dahling, you still look MAH-velous!! 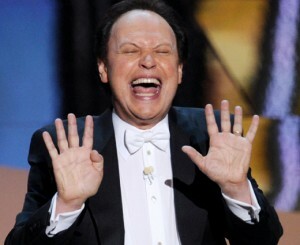 Looking at that photo of Billy Crystal makes me want to throw up. Rather than trying to age gracefully, he has had so many facelifts all his skin is tied behind his head in a ponytail. Likewise his humor. Rather than trying to remain somewhat hip and topical, he has turned himself into another Myron Cohen (if you’re old enough to remember him). It’s sad but funny. Jewdar, I got a degree from UW-Madison too… And your bashing of old Jews I’d humorous, since one day you’ll be an old Jew too, hopefully participating in the Oscars, of course. Sometimes when I read Jewdar posts I wonder if the “Protocols of the Elder of Zion” was not written by Jews for some Purim Carnival and was then adopted by the anti-Jewish all over the world. As for the Oscar of the Iranian it was very clear that they will win and I knew it many days before the start of the ceremony. The reasons are due to an attempt of the “Academy” to show and declare an independence from a political situation and pronounce some hallucination that they live in a pure world of art. On Wisconsin, Jimi. But Jewdar bashing old Jews? You got the wrong guy, Jewdar loves him some old Jews. And judging by the Oscars numbers from last year to this one, we’re not the only ones. And Yuli, I’m going to presume you were complimenting me. If not, be kind and allow my illusions.